Left-wing candidate Andrés Manuel López Obrador has claimed victory in Mexico's presidential election, saying "profound change" is coming. The ex-Mexico City mayor, known by his initials Amlo, is projected to win about 53% and his rivals have conceded. He vowed to tackle the "evil" of corruption, saying it had caused social inequality and violence in the country. Relations with Washington have been strained since the election of President Donald Trump, who has strongly criticised Mexico over trade and migration. Mr. Trump sent out a tweet of congratulations. Speaking late on Sunday, the 64-year-old promised to respect civil liberties and said he was "not looking to construct a dictatorship, either open or hidden". Some opponents have expressed fears that his leftist and populist policies could damage the already sluggish economy and turn Mexico into "another Venezuela", which is suffering a deep economic crisis and rampant inflation. Hailing a "historic night", Mr. López Obrador called on all Mexicans to reconcile and repeated his campaign pledge to review energy contracts for signs of corruption. The president-elect ran under a three-party coalition led by the leftist National Regeneration Movement party (Morena) he founded in 2014. So what are his other main policies? On combating Mexico's record levels of violence, Mr. López Obrador said he would have daily meetings with his security cabinet, which under him, he said, would be under a "unified command". During the campaign Mr. López Obrador had often used confrontational language when referring to Mr. Trump, but struck a more conciliatory note in his victory speech, saying that he would seek "friendly relations". He also tried to reassure the business sector, parts of which have been nervous about him winning, saying there would be no nationalisation and that he would respect private business. He also said his government would be fiscally disciplined and taxes would not be raised. On social policies, he said he would double pensions for the elderly upon taking office on 1 December as a first step to reducing Mexico's disparate income levels. What have his rivals said? 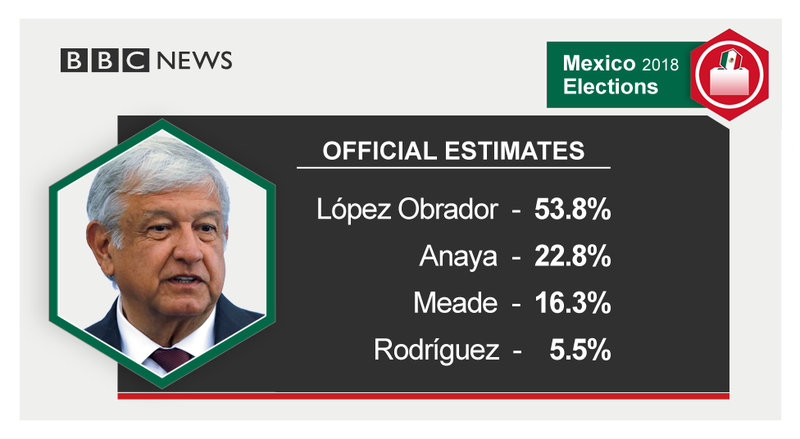 A quick count after Sunday's poll indicated Mr. López Obrador had won more than double the votes of his nearest challenger. It was the widest victory since the 1980s. Ricardo Anaya, candidate for the conservative National Action Party (PAN), looked set to be runner-up to Mr. López Obrador. "I recognise his triumph, I express my congratulations, and I wish him the greatest success for the good of Mexico," Mr. Anaya said. Ruling party candidate José Antonio Meade, who lies in third place according to initial results, told supporters that he wished the winner "the greatest success". Mr. Meade's Institutional Revolutionary Party (PRI) has dominated Mexican politics for much of the past century but has slumped in popularity. Preliminary figures put official turnout at just over 60%. As well as a new president, 128 senators and 500 deputies in Congress were elected, in addition to state and local officials. Mr. López Obrador's coalition is set to have a majority in the lower house and possibly the Senate. Mr. López Obrador had been runner-up in Mexico's two previous elections but has now ended the dominance of incumbent President Enrique Peña Nieto's PRI and the PAN. He has referred to the parties as being part of the same "mafia of power". Mr. López Obrador had been the candidate most critical of Mr. Trump and had said he would make the US president "see reason". Mr. Trump has riled Mexico by saying he will renegotiate the North American Free Trade Agreement (Nafta) and build a wall along the US-Mexico border. His hardline stance on migration - particularly the separation of migrant families at the US border - has brought widespread condemnation. Some 2,000 children remain separated from their migrant parents, despite Mr. Trump agreeing to curtail the policy. In his victory speech, Mr. López Obrador said: "We will pursue a relationship of friendship and co-operation with the United States, always rooted in mutual respect and in the defence of our fellow Mexicans who live and work honourably in that country."